Build up your savings systematically with monthly fixed deposits over a period of time. Avail IDBI bank’s Recurring deposit options to save money and earn interest on your payments. Continue reading to see what the syndicate bank recurring deposit options have to offer!it. RD rates upto 7.15 % are offered with quarterly compounding. TDS deductions are not applicable on bank deposits. Saving a specific amount of money every month can lead to a substantial amount for the emergency fund in the long term.Recurring deposit options can be availed to do so. However, they are not the best saving option if wealth creation is the objective. Let’s see you plan on saving for your retirement. 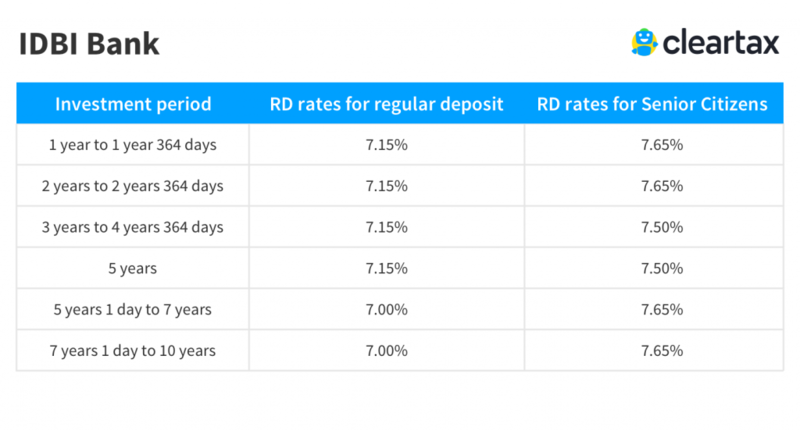 A Recurring Deposit with 7.15% interest rate may not give you the returns needed to create a decent retirement fund. However, depositing the same amount in a Mutual Fund as SIP (Systematic Investment Plan) can help you create the kind of wealth you are aiming for. The individual can open an account in his/her name as well joint account can be opened by 2 individuals. A minor can open an RD account under parental guardianship. HUFs, companies, government departments, clubs , associations, partnership firms religious/charitable trusts etc. are eligible as well. IDBI bank allows account holders to prematurely withdraw money but a nominal amount of penalty might be levied based on the scheme chosen. However, partial withdrawal of amount is not allowed.